Located 10 minutesâ?? drive from historic central Aiken this hotel features a deluxe continental breakfast and access to the Houndslake Country Club. Massages and personal training sessions are available by appointment. 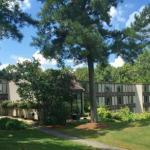 Free Wi-Fi and a flat-screen cable TV are provided in all the rooms at The Inn at Houndslake. Decorated with warm colours and original artwork rooms come equipped with a work desk and ironing facilities. Country club access is provided to the guests of the Houndslake Inn. Features include a 27-hole championship golf course and a tennis centre with 8 lighted courts. And outdoor swimming pool with diving platform and a fitness centre is also open to guests. A formal dining room serves lunch and dinner. A full services lounge which offers a full pub menu is located on the grounds. The Hitchcock Woods 70 miles of hiking and running trails is less than 5 miles from the inn. Central Augusta is 35 minutesâ?? drive away.